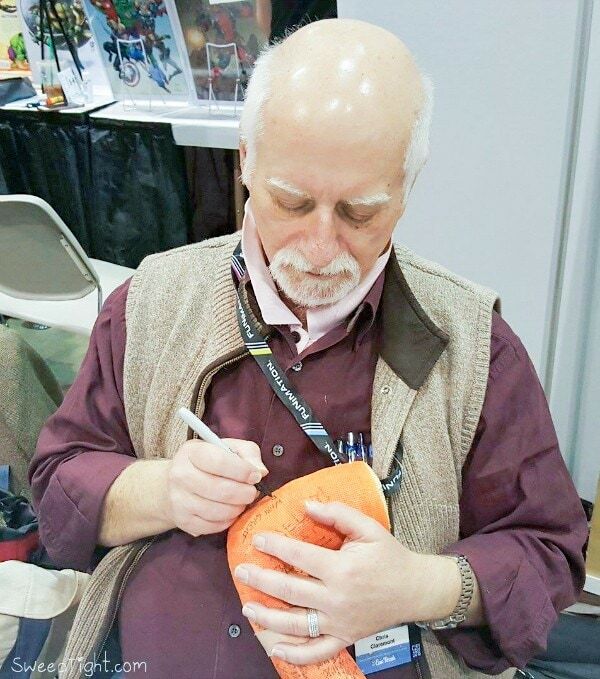 This year’s Chicago Comic Entertainment Expo (C2E2) was a bucket list worthy event for me. It was an experience 20 years in the making and I’ll explain that in detail below. 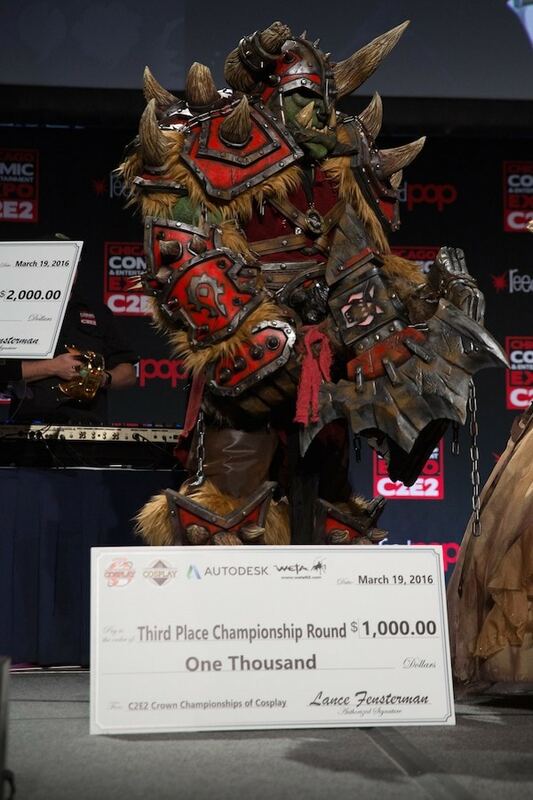 But I cannot do this expo justice without talking about the elaborate cosplay too. I received a complimentary press pass in order to facilitate this post but all thoughts and opinions shared here are based solely on my experience. Affiliate links are included. 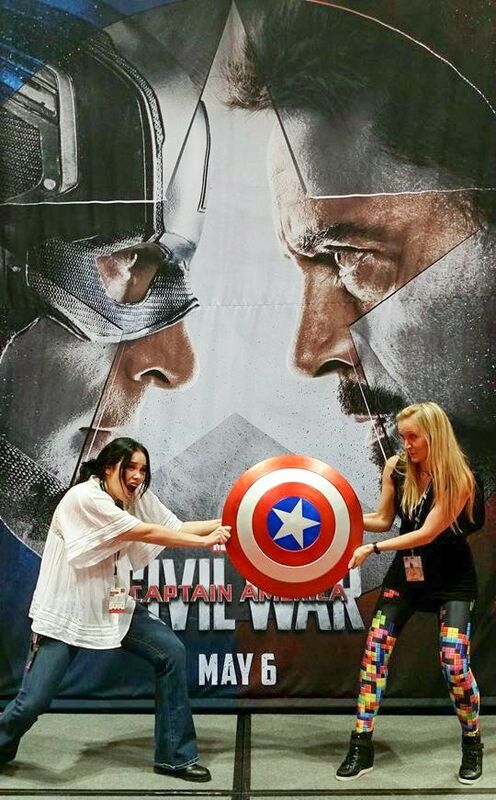 Meredith and I are clearly on different sides for the upcoming Captain America: Civil War movie. I’m #TeamIronMan all the way! 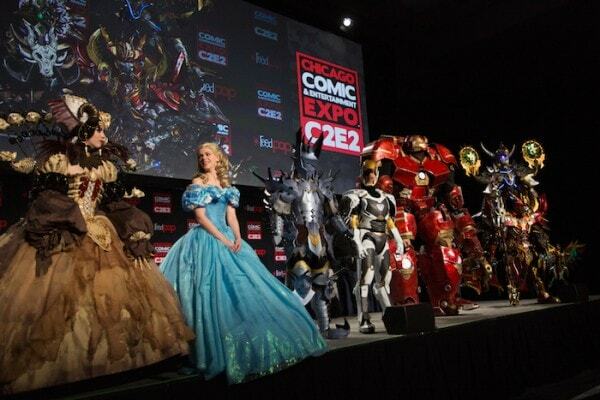 Some attend C2E2 for the comics, to meet celebrities, or to check out the latest nerdy games. Others go to strut they’re incredible costumes. Many go for the sole purpose of people watching. I can officially report that all of these are worthy reasons to attend. The Chicago Comic Entertainment Expo met the expectations in all categories. I was only able to attend the event on Friday and for a short bit on Saturday. 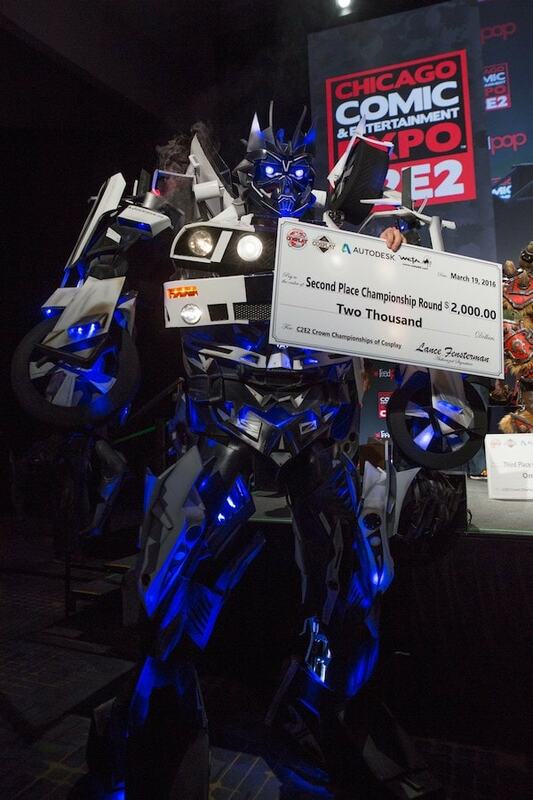 The cosplayers were definitely more abundant on Saturday but check out these phenomenal photos of the winners of ReedPOP‘s Cosplay Competition! I couldn’t believe how outrageous and spectacular these costumes were! It’s so fun to be around people in their element. The passion is contagious. All these costumes wouldn’t be possible without the creators and writers of famed characters. 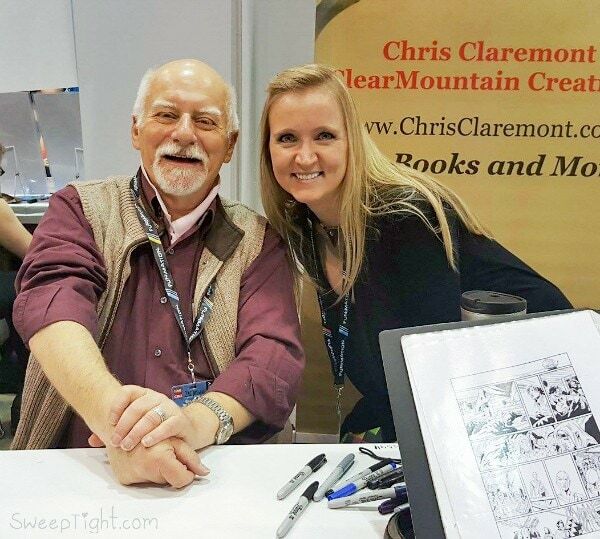 Which brings me to my main mission of the Chicago Comic Entertainment Expo: meet Chris Claremont. I was in the fourth grade. It was a beautiful day and we were enjoying recess outside. My friends and I, per usual, were playing as our favorite X-Men characters. I was Rogue. I had stolen Storm’s powers and was summoning the wind to attack another student who was playing as my enemy. I had him “pinned” on the ground when another boy playing as Beast plowed into me successfully breaking both bones in my wrist and shattering my growth plate. I had to wear a cast up to my armpit for a month! When I heard we were going to have the opportunity to interview Chris Claremont, (THE FREAKING CREATOR OF MY FAVORITE X-MEN CHARACTERS!) I dug through the house and found my old–oddly still stinky–cast. A huge thank you to Meredith for capturing this spectacularly geeky moment of my life. He’s a comic super hero GOD. Literally. He created many of my favorite characters such as: Rogue, Psylocke, Wolverine, Cable, and Mystique. I’m not sure how accurate this list is, it seems to be missing a few. But you get the idea. He’s a badass. He was responsible for turning X-Men into the empire that it is today. Before he started writing for them, their sales were pathetic. Shortly after he started on the team… well, you know how far that comic has gone! Chris introduced some of the first super powered female characters. In a time when women’s rights were just becoming acknowledged, his progressive ideas for female leads that could easily overpower male heroes gave women and little girls everywhere the ability to release their own inner potential. His aunt and his mom were incredible women that were fighting real life battles. He said he listened on live radio to the sounds of his aunt speaking to them while bombs were going off in the background. It’s no wonder he wanted to create invincible women. I asked him who his favorite character was to write, to which he responded: “The one I haven’t written yet.” Well played. I wondered where Wolverine’s “Hey, Bub”, came from, and Chris said it’s from being in Canada and listening to people talk. During our interview there was a lengthy line of fans patiently waiting to meet Chris and have him sign their comics and collectibles. We were lucky to be able to sneak in and ask him our questions. I’d like to send a huge shout out to all those fans who didn’t even flinch at our longer-than-average time spent with Chris. 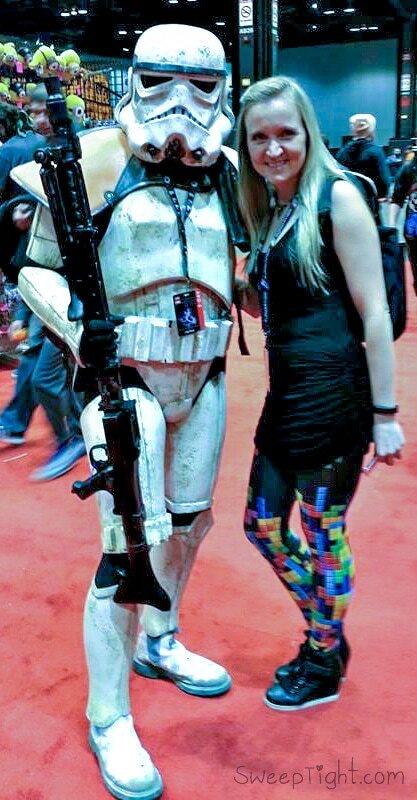 Have you ever been to the Chicago Comic Entertainment Expo? I haven’t been there yet, but one of my daughters goes every year. She cosplayed different characters every day, including dressing up with one of her best friends as the sisters from Frozen on Sunday for Children’s Day. One of these days I’ll go, but I will be at ACEN (Anime Central) in Rosemont in May, and then the very next weekend we’ll be driving to Raleigh, NC for Animazement. Looks like lots of fun people watching. Love your leggings. It looks like you had a ton of fun! I’ve never been on comic con, my son as been a few times though and really enjoyed it. I have never been to this show. I enjoyed seeing it through your words and photos. It seems like a lot of fun. Kayla I wish you could’ve been there! It was so awesome!!!! wow, i never been to a comic event but i am sjure i will love it. its amazing to meet people with similar similarties that enjoy the same stuff as you. this was a great article and thanks for sharing.